The Legionella bacterium was first identified in the summer of 1976 during the 58th annual convention of the American Legion, which was held at the Bellevue-Stratford Hotel in Philadelphia. Infection was presumed to be spread by contamination of the water in the hotel's air conditioning system. The presentation ranged from mild flulike symptoms to multisystem organ failure. Of the 182 people infected, 29 died. Although Legionella was not identified until 1976, L pneumophila was subsequently found in a clinical specimen dating to 1943 and, according to retrospective analysis, may have been responsible for pre-1976 pneumonia epidemics in Philadelphia; Washington, DC; and Minnesota. Legionnaires disease is the term that collectively describes infections caused by members of the Legionellaceae family. For patient education information, see Bronchoscopy. 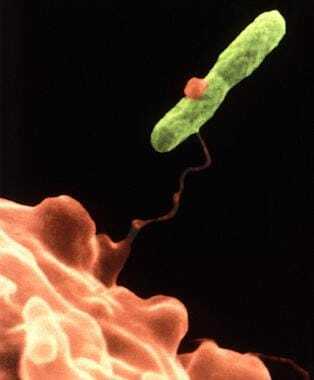 This electron micrograph depicts an amoeba, Hartmannella vermiformis (orange), as it entraps a Legionella pneumophila bacterium (green) with an extended pseudopod. After it is ingested, the bacterium can survive as a symbiont within what then becomes its protozoan host. The amoeba then becomes a so-called "Trojan horse," since, by harboring the pathogenic bacterium, the amoeba can afford it protection. In fact, in times of adverse environmental conditions, the amoeba can metamorphose into a cystic stage, enabling it, and its symbiotic resident, to withstand the environmental stress. Image courtesy of the Centers for Disease Control and Prevention and Dr. Barry S Fields. Legionella species infect human macrophages and monocytes; intracellular replication of the bacterium is observed within these cells in the alveoli. The intracellular infections of protozoa and macrophages have many similarities. Activated T cells produce lymphokines that stimulate increased antimicrobial activity of macrophages. This cell-mediated activation is key to halting the intracellular growth of legionellae. The significant role of cellular immunity explains why legionellae are observed more frequently in immunocompromised patients. Humoral immunity is thought to play a secondary role in the host response to legionellae infection. Legionnaires disease may be travel associated from exposure in aircraft or hotel facilities. Person-to-person transmission, however, has not been documented. The highest incidence of Legionnaires disease occurs during late spring and early fall, when air-conditioning systems are used more frequently. [5, 6] Nosocomial acquisition likely occurs via aspiration, respiratory therapy equipment,  or contaminated water. In addition, transmission has been linked to the use of humidifiers, nebulizers, and items that were rinsed with contaminated tap water. LD has a reported incidence of 8000-18,000 cases per year. In certain geographic areas, community-acquired LD is more common. Although LD is reportable in all 50 states, it is estimated that only 5-10% of cases are reported. While most cases of the disease are sporadic, 10-20% of them are linked to outbreaks. LD is more common in the summer, especially in August, and is slightly more prevalent in the northern US. Prevalence reports for Legionella have increased with time, likely due to the availability of more effective testing modalities. However, it is also possible that Legionella infections are increasing in frequency for environmental, population-based, or behavioral reasons. LD is among the top 3-4 microbial causes of CAP, constituting approximately 1-9% of patients with CAP who require hospitalization. LD is an even more common cause of severe pneumonia in patients who require admission to an intensive care unit (ICU), ranking second, after pneumococcal pneumonia, in such cases. In addition, it has become recognized as the most common cause of atypical pneumonia in hospitalized patients. LD is thought to occur worldwide and to be the cause of 2-15% of all CAP cases that require hospitalization. Outbreaks have been recognized throughout North America, Africa, Australia, Europe, and South America. Men have a greater risk of acquiring L pneumophila infection. Older age is another risk factor; the weighted mean age for patients with LD is 52.7 years, with increasing incidence until age 79 years. Mortality rates are also higher in older patients. The incidence of LD in persons younger than 35 years is less than 0.1 cases per 100,000 people. Recovery is variable in LD; some patients experience rapid improvement, while others have a much more protracted course despite treatment. The mortality rate approaches 50% with nosocomial infections. Progressive respiratory failure is the most common cause of death in patients with Legionella pneumonia. However, the mortality rate depends on the comorbid conditions of the patient, as well as on the choice and timeliness of antibiotics administration. The site of acquisition (eg, nosocomial, community-acquired) may also affect the outcome. Kozak-Muiznieks NA, Lucas CE, Brown E, Pondo T, Taylor TH Jr, Frace M, et al. Prevalence of sequence types among clinical and environmental isolates of Legionella pneumophila serogroup 1 in the United States from 1982 to 2012. J Clin Microbiol. 2014 Jan. 52(1):201-11. [Medline]. [Full Text]. Nguyen TM, Ilef D, Jarraud S, Rouil L, Campese C, Che D. A community-wide outbreak of legionnaires disease linked to industrial cooling towers--how far can contaminated aerosols spread?. J Infect Dis. 2006 Jan 1. 193(1):102-11. [Medline]. Woo AH, Goetz A, Yu VL. Transmission of Legionella by respiratory equipment and aerosol generating devices. Chest. 1992 Nov. 102(5):1586-90. [Medline]. Granseth G, Bhattarai R, Sylvester T, Prasai S, Livar E. Notes from the Field: Two Cases of Legionnaires' Disease in Newborns After Water Births - Arizona, 2016. MMWR Morb Mortal Wkly Rep. 2017 Jun 9. 66 (22):590-591. [Medline]. Brandsema PS, Euser SM, Karagiannis I, DEN Boer JW, VAN DER Hoek W. Summer increase of Legionnaires' disease 2010 in The Netherlands associated with weather conditions and implications for source finding. Epidemiol Infect. 2014 Jan 24. 1-12. [Medline]. Halsby KD, Joseph CA, Lee JV, Wilkinson P. The relationship between meteorological variables and sporadic cases of Legionnaires' disease in residents of England and Wales. Epidemiol Infect. 2014 Jan 9. 1-8. [Medline]. Cristino S, Legnani PP, Leoni E. Plan for the control of Legionella infections in long-term care facilities: Role of environmental monitoring. Int J Hyg Environ Health. 2011 Sep 16. [Medline]. Lin YE, Stout JE, Yu VL. Controlling Legionella in hospital drinking water: an evidence-based review of disinfection methods. Infect Control Hosp Epidemiol. 2011 Feb. 32(2):166-73. [Medline]. van Loenhout JA, van Tiel HH, van den Heuvel J, Vercoulen JH, Bor H, van der Velden K, et al. Serious long-term health consequences of Q-fever and Legionnaires' disease. J Infect. 2014 Jan 25. [Medline]. Cunha BA. Hypophosphatemia: diagnostic significance in Legionnaires' disease. Am J Med. 2006 Jul. 119(7):e5-6. [Medline]. Kashuba AD, Ballow CH. Legionella urinary antigen testing: potential impact on diagnosis and antibiotic therapy. Diagn Microbiol Infect Dis. 1996 Mar. 24(3):129-39. [Medline]. [Guideline] Arizona Department of Health Services. Guidelines for water immersion and water birth. ADHS. Available at http://www.azdhs.gov/documents/licensing/special/midwives/training/guidelines-for-water-immersion-water-birth.pdf. November 2016; Accessed: June 9, 2017. Cunha BA. Legionnaires' disease: clinical differentiation from typical and other atypical pneumonias. Infect Dis Clin North Am. 2010 Mar. 24 (1):73-105. [Medline]. Cunha BA, Strollo S, Schoch P. Extremely elevated erythrocyte sedimentation rates (ESRs) in Legionnaires' disease. Eur J Clin Microbiol Infect Dis. 2010 Dec. 29 (12):1567-9. [Medline]. Cunha BA. Highly elevated serum ferritin levels as a diagnostic marker for Legionella pneumonia. Clin Infect Dis. 2008 Jun 1. 46 (11):1789-91. [Medline]. Abbreviations: CPK = creatinine phosphokinase test; CRP = C-reactive protein; ESR = erythrosedimentation rate. a Pulmonary symptoms: shortness of breath, cough, and so forth with fever and a new focal/segmental infiltrate on chest radiograph. b Otherwise unexplained. If finding is due to an existing disorder, it should not be used as a clinical predictor.